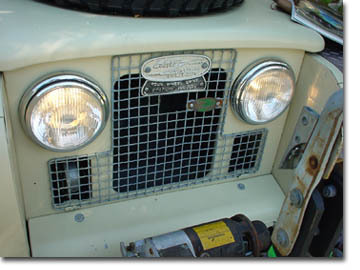 Land Rover "Alaska" and "Hercules"
These aren't just ordinary headlights, they're Hellas! They feature a lamp that uses replaceable bulbs. 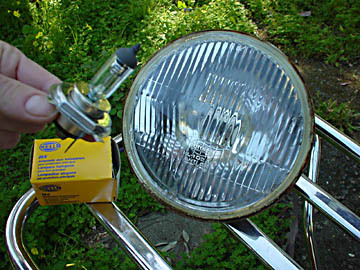 We've swapped the bulbs with a set with an extra strong high-beam (100 watts) to light up the road at night. They're used with discretion however as they must be dimmed so oncoming traffic isn't blinded. 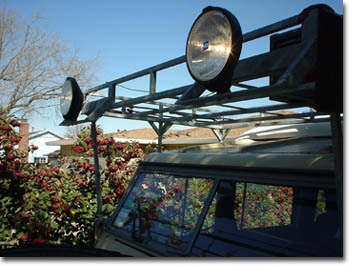 These are great lights and they come in real handy when driving at night on uneven pavement (trails). We have mounted them up high enough to allow us to see over the next hill as we approach.